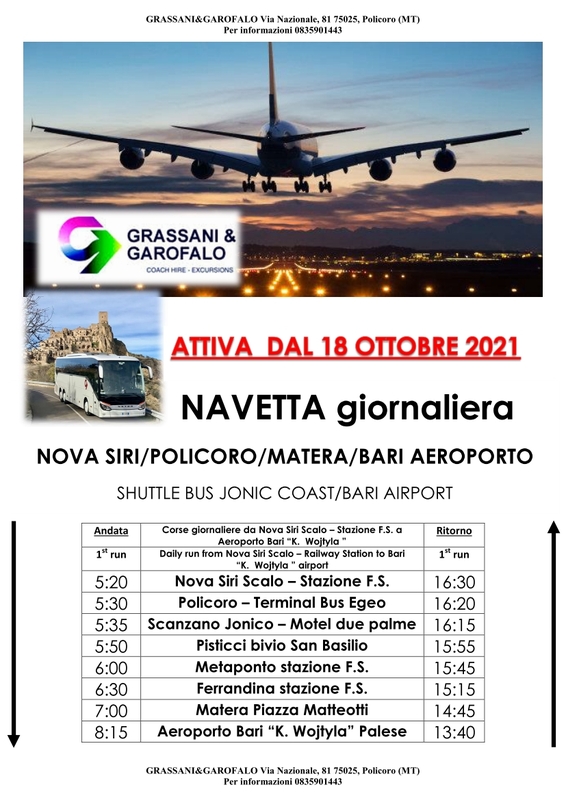 From Bari Palese Airport take the shuttle bus (timetables). From Rome and Naples Airports take a bus or a train. Option 1) exit at Sicignano, take the S.S. 407 Basentana in the direction of Potenza-Metaponto, then take the S.S. 106 Jonica towards Reggio Calabria. Option 2) exit at Atena Lucana, take the S.S. 598 Fondovalle d’Agri S.S, then take the S.S. 106 Jonica towards Reggio Calabria. Option 3) exit at Lauria Nord, take the S.S. 653 Sinnica, then take the S.S. 106 Jonica towards Taranto. exit at Palagiano, take the S.S. 106 Jonica towards Reggio Calabria.